BUT ONLY ADDING 2 YO"
I think the problem is a matter of knowing how to read lace patterns. In lace patterns there are often ‘shared’ elements that have to split when the edge of the fabric is reached. Row 2 of Coral ends with a k2 INSTEAD of a k3. 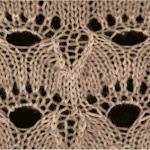 In row 2 of the chart you see three knit stitches in the center framed by an ssk on one side and a k2-tog on the other side – the center stitch of those three knit stitches is ‘shared’ between pattern repeats. At the edge of the fabric these three stitches --must be ‘split’ to maintain the symmetry of the fabric. That is done by adding the +1 stitch and then splitting it into a k2 on either edge of the fabric. Similarly, on Row 6 the sl 1-k2-tog-psso has to be split at the outer edge of the fabric. Again the +1 stitch allows the sl 1-k2-tog-psso to be split into a k2-tog at the beginning of the row and an ssk INSTEAD of the sl 1-k2-tog-psso in the last repeat. The shared elements are more easy to identify when a pattern is charted. When knitting from a written lace pattern, you may often have to just accept the instructions that tell you how to force the ending at the fabric edge on the last repeat. Whenever I see a double decrease converted to a single decrease at the end of a lace pattern, I know the instructions are just telling me to work ‘half’ of the double decrease to keep the fabric even.